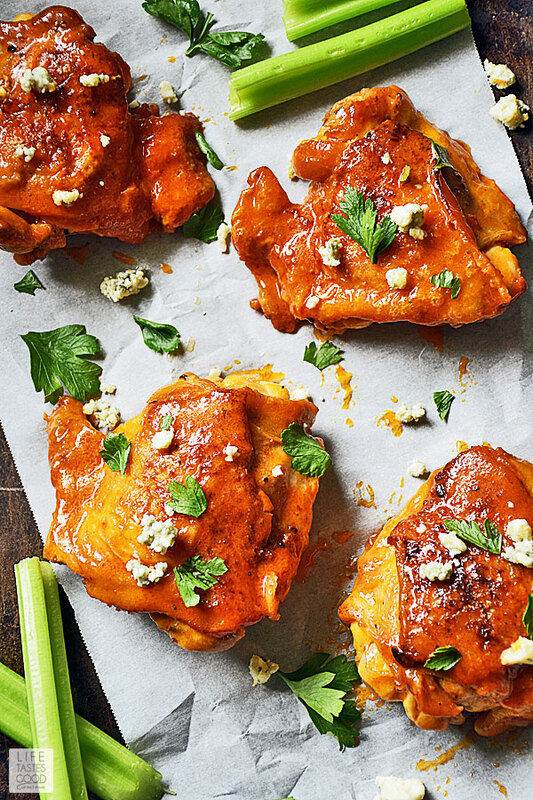 Dripping in a spicy, buttery buffalo wing sauce, Baked Buffalo Chicken Thighs are just as good, if not better, than your favorite buffalo chicken wings. They are low carb, easy to make, and budget-friendly too! I just LOVE buffalo chicken wings! Do you? They are so good y'all, and I love the fact they are low carb. 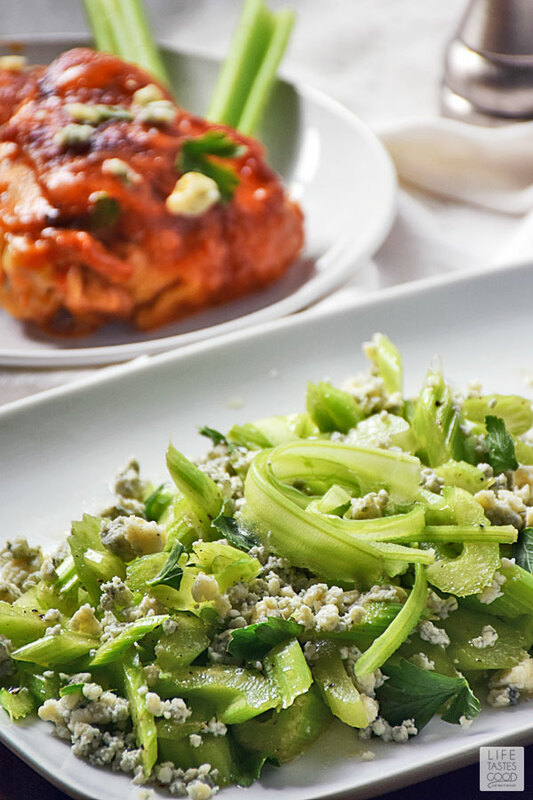 One of my absolute favorite low carb treats is my Low Carb Buffalo Wings with Gorgonzola Sauce. The combination of those spicy wings with the cool, yet tangy, Gorgonzola sauce is epic! But I DON'T love the price of chicken wings! They are so much more expensive than chicken thighs. Like 150% more!! That's a lot of dough for such a tiny piece of chicken. 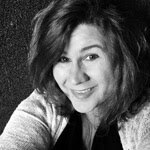 I needed to find an alternative, because I love me some low carb buffalo wings! 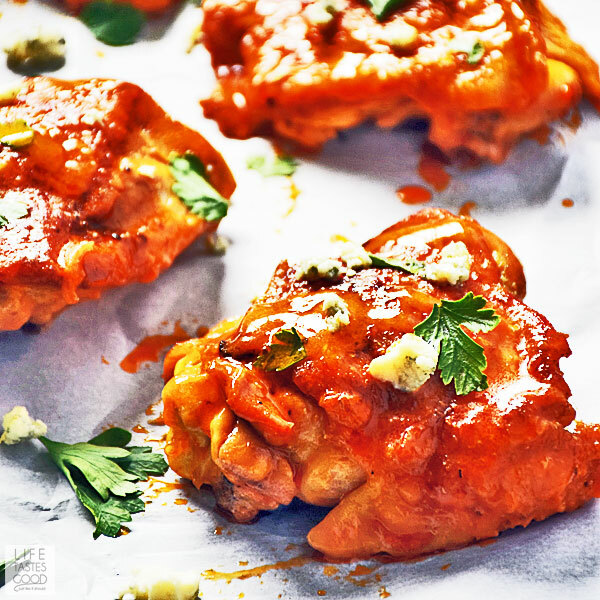 That's when I decided to use the same sauce from my Low Carb Buffalo Wings recipe on chicken thighs and this recipe for Baked Buffalo Chicken Thighs was born! Chicken thighs are definitely a more budget-friendly alternative to chicken wings. I like that! How Do You Cook Chicken Thighs? Chicken thighs are really easy to make. So much so, that it is hard to mess up chicken thighs. You can cook chicken thighs in the oven, on the grill, in the slow cooker, and even in a skillet. But the best method I've found for cooking chicken thighs, while still maintaining a crispy skin, is a 2-step process. After seasoning the chicken thighs, you sear them in a cast iron skillet and then finish in the oven until the internal temperature reaches 165°F in the thickest part of the meat. The cast iron skillet is all you need to cook chicken thighs in the oven. Less mess is better, right?! Why do you use bone in chicken thighs instead of boneless? This is a question I get A LOT! I use bone in, skin on chicken thighs for most of my chicken thigh recipes because it delivers a more flavorful and juicer chicken thigh with deliciously crispy chicken skin. It's all about the flavor and crispy skin! Plus, bone in, skin on chicken thighs are cheaper. Maximizing flavor AND savings at the same time is winning (in my book)! There are times when I use boneless, skinless chicken thighs, and when I do I typically marinate the chicken thighs and do a quick pan sear for use in a chicken wrap, chicken tacos, or chicken salad. I keep the seasoning very simple with a mix of kosher salt, freshly cracked black pepper, and garlic powder (optional). Generously sprinkle the seasoning mixture under the chicken thigh skin. 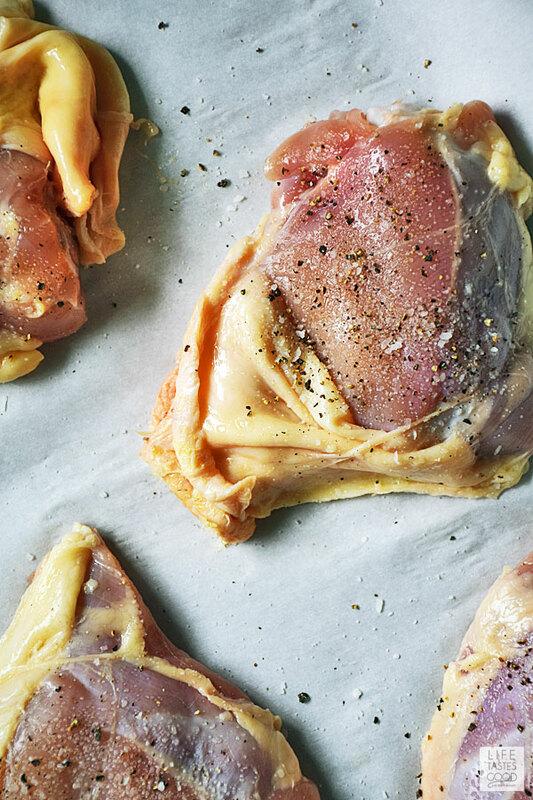 It's very easy to pull back the chicken thigh skin to season directly on the chicken meat. This gives the chicken thigh meat more flavor and also keeps the skin from being blotchy when searing. After seasoning, pull the skin back over the chicken thigh to cover. Sear the chicken skin side down in a hot,dry cast iron skillet (no oil needed) over mid high heat for about 5-6 minutes until the chicken releases easily from the skillet without sticking. Once the chicken skin is nicely seared, flip over each piece of chicken and place the whole skillet in a preheated, 450°F oven for 20-30 minutes until cooked through. It is truly that easy to cook chicken thighs in the oven! Cooking chicken thighs in the oven using this 2 step method results in a deliciously crispy skin and juicy chicken thigh. The chicken thighs have a deep roasted flavor and are a go-to easy dinner recipe served right out of the oven. I definitely recommend using a cast iron skillet. They are oven safe, inexpensive, and will last forever when properly cared for. A cast iron skillet will produce a crispier skin, but if you don't have one and don't want to purchase one yet, you can use a stainless steel skillet. Avoid using a non-stick skillet as most are not oven safe and the skin won't get as crispy. 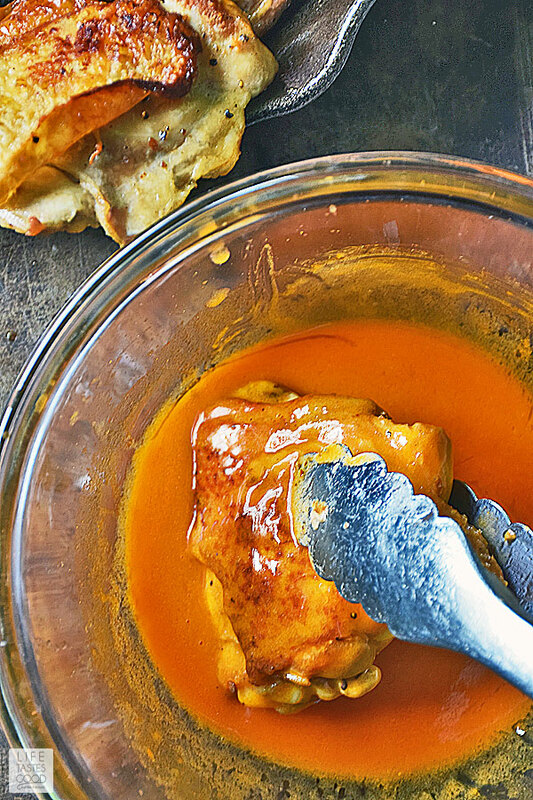 To coat the chicken thighs in that irresistable, spicy, buttery buffalo wing sauce, toss the baked chicken thighs in a mixture of cayenne pepper sauce (this is the one I use) and melted butter. Let the chicken thighs rest about 5 minutes to absorb the buffalo sauce. 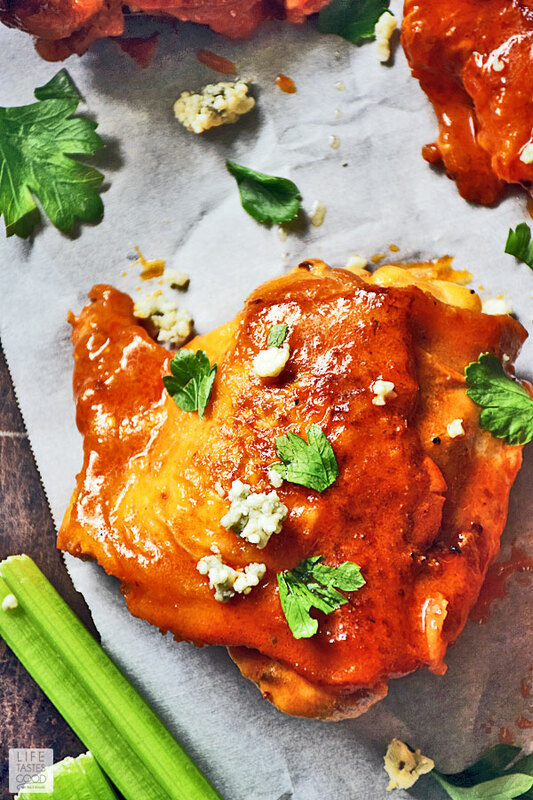 Enjoy the spicy, buttery goodness of Baked Buffalo Chicken Thighs and feel good knowing you saved a bundle by using chicken thighs instead of chicken wings! Combine 1/2 tablespoon kosher salt, 1 teaspoon freshly ground black pepper, and 1 teaspoon garlic powder. Season each thigh evenly under the skin. Heat a cast iron skillet over mid-high heat. 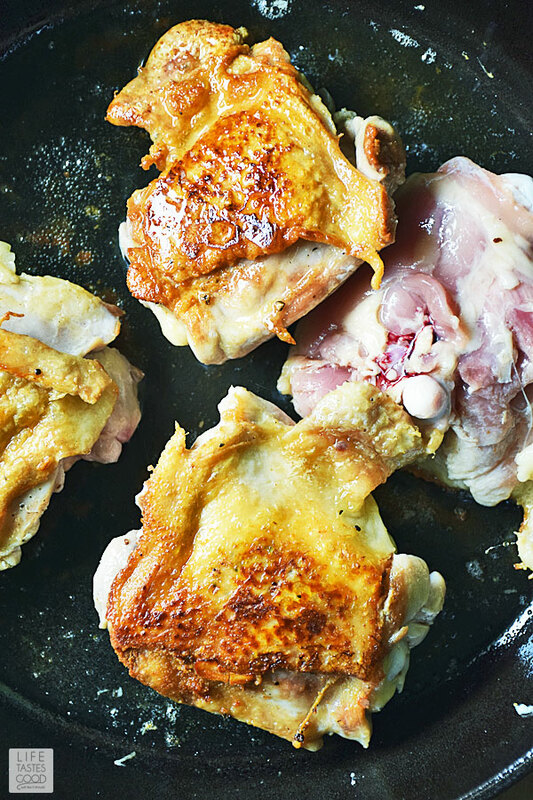 Place the chicken thighs skin side down into the hot skillet in a single layer. Sear 5-6 minutes until the chicken releases without sticking to the pan. Use tongs to gently lift the chicken thighs and flip over each piece. If the skin sticks allow them to sear another minute or so until they release. Transfer the skillet to the preheated oven and cook for 20-25 minutes until thighs reach 160° F. Check the temp using an instant read thermometer. While the chicken thighs are cooking, combine 3 ounces Frank's Red Hot Sauce with 3 tablespoons butter in a microwave safe bowl. Microwave until butter is melted. Whisk to combine. When the chicken is cooked through, toss in the sauce mixture until coated. Let the chicken thighs rest about 5 minutes to absorb the buffalo sauce. Enjoy!